The Shenvalee began in 1926 when Roland F. Hill came to New Market and purchased what was then called the “Dr. Strayer Farm.” Hill would use the land to create a resort hotel and golf course. 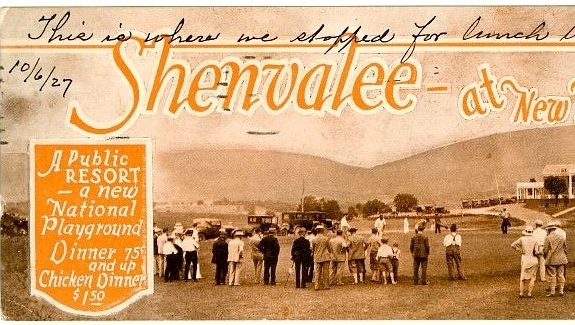 Local newspaper publisher John G. Miller would eventually chose the name Shenvalee, a combination of the words Shenandoah, Virginia, and Lee for the site. 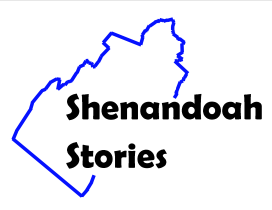 That era’s economic prosperity had allowed numerous tourist attractions to emerge in Shenandoah County. 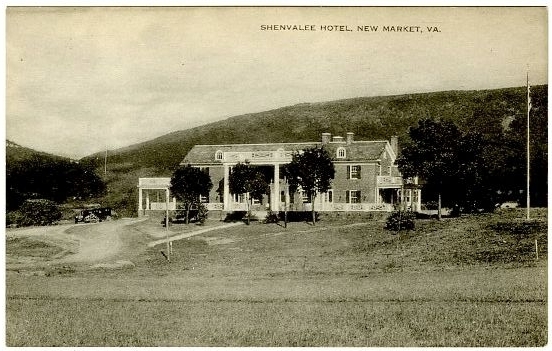 Shenandoah, Endless, and Luray Caverns, Civil War sites in Strasburg and New Market, and resorts at Orkney Springs, Bryce, and Shenandoah Alum Springs brought thousands of visitors to Shenandoah County each year. Many of these visitors were residents of Washington DC and its suburbs who were looking to escape the city during the summer. Roland Hill’s attraction was designed to attract these individuals and to add to the county’s appeal. 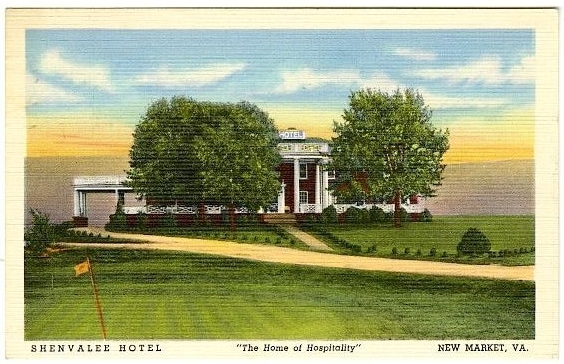 Hill took the dwelling that stood on the property and enlarged it into a two-story hotel whose rooms surrounded a large ballroom. He also created a nine-hole golf course on the site. 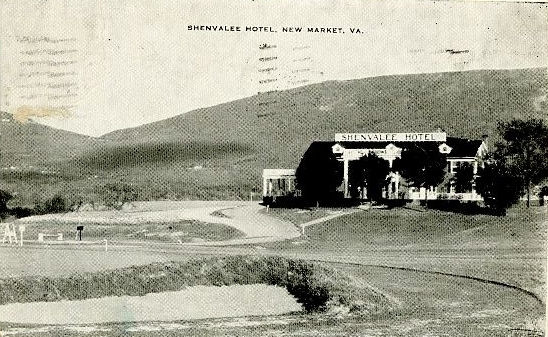 This was the first golf course opened in Shenandoah County. What is today known as the “Olde Course” was constructed by teams of men using picks, shovels, and wagons. 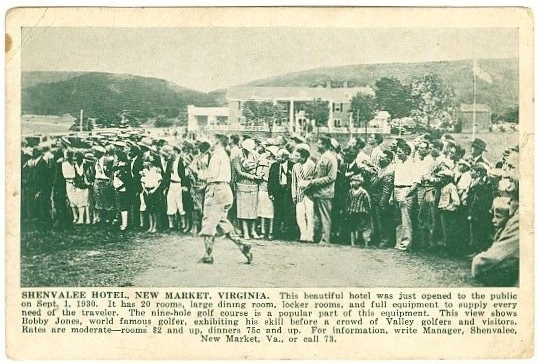 Both the hotel and course opened on July 7, 1927. Bobby Jones, a popular amateur golfer and co-founder of the Masters Tournament, was the first to tee off. 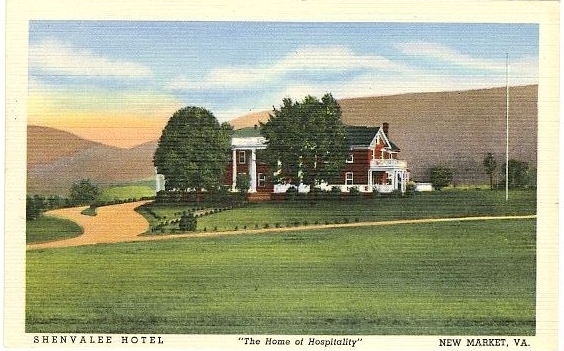 Shenvalee developed the tagline “The Home of Hospitality” to promote the site. It advertised its proximity to local attractions, natural beauty, quiet atmosphere, and golf facilities. Visitors, and numerous locals, also flocked to the resort for its well-known food and dining facilities. A fire that heavily damaged the hotel in 1929 led to a complete renovation that added a third floor and eliminated the ballroom. 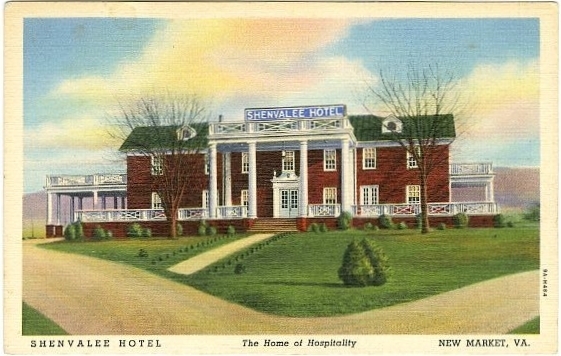 During the Second World War the Shenvalee Hotel was selected by the US State Department to house diplomatic internees. From October 4, 1943 until December 5, 1944 the resort was closed to the public and 19 Italian diplomats who had been captured in North Africa or detained in the United States were held at the site. Although the detainees were guarded by New Market residents and a guard dog, they had an easy time. There were allowed the freedom of the hotel grounds and the town, enjoyed mountain hikes, tennis, and golf, and were not required to work. Many had concerns that these interaction with “the community will result in serious repercussions,” a concern that was realized on one occasion when two of the detainees were attacked by a group of young men. In addition, one Italians, Luigi Bosinco, proved to be an adventurous type. He first caused a scandal by passing “letters of admiration” to a Mrs. O’Roark, a married desk clerk at the hotel who fell in love with Mr. Bosinco and offered to leave her husband and child and “run away with him.” Making the situation more delicate, Mrs. O’Roark was also the daughter of the police chief. Mrs. O’Roark was discharged and “advised that her secret would be guarded” in order to spare her scandal. In May 1944, Bosinco also became the only detainee to escape, making it to Mt. Jackson before being recaptured. On December 5, 1944, the detainees left the hotel for repatriation to Italy. Most were, understandably, unhappy to be leaving, knowing that they were trading their carefree lives at Shenvalee for the harsh environs of war-torn Italy. 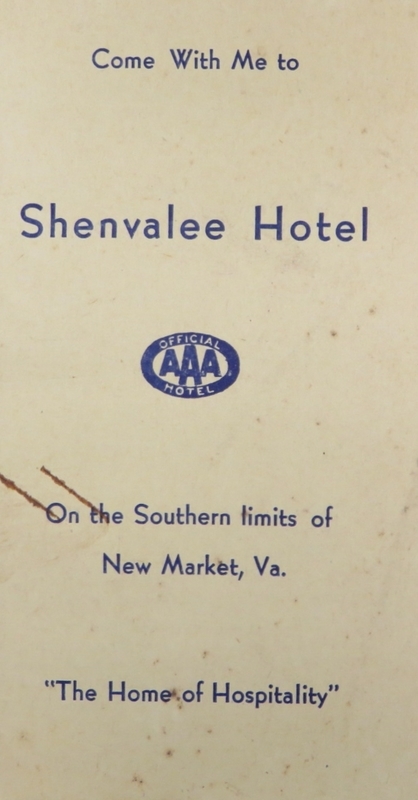 After the detainees departed, Shenvalee reopened to the public and began to thrive in the post war years as the tourism industry boomed. This lead to an expansion of the resort starting in 1960 when a pool and the accompanying Pool Side Motel opened. Four years later an additional 9-hole course was completed. In 1969 the Golf Course Motel was added and was expanded in 1973. A final 9-hole course was added in 1992, making Shenvalee a 27 PGA hole course. 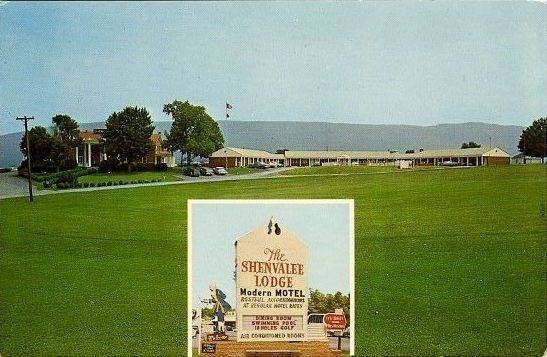 Today, Shenvalee remains one of the area’s more popular attractions and continues to attract a wide array of visitors who come to golf or to enjoy the resorts amenities. 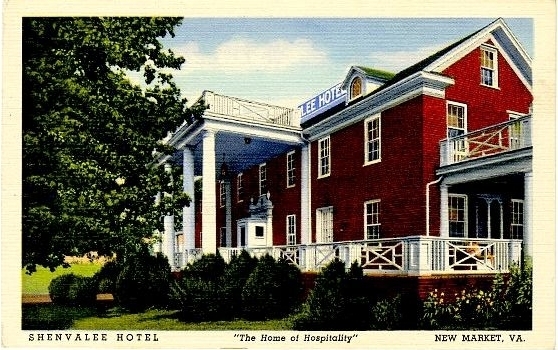 Shenvalee Hotel "The Home of Hospitality" New Market, VA : Postcard showing the main structure at the Shenvalee Hotel in New Market Virginia. ~ Source: Herb Parker Postcard Collection ~ Creator: Genuine Curteich, Chicago Ill. 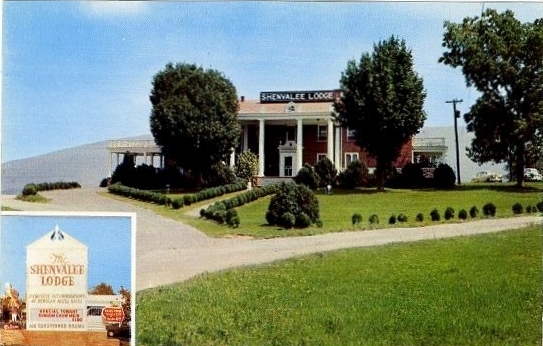 The Shenvalee Lodge : Postcard showing the Shenvalee Lodge and Motel in New Market Virginia ~ Source: Herb Parker Postcard Collection ~ Creator: Bill Bennett Studios, Phila. & Pennsburg Pa.
Shenvalee Hotel "The House of Hospitality" New Market VA : Postcard showing the Shenvalee Hotel in New Market Virginia ~ Source: Herb Parker Postcard Collection ~ Creator: Genuine Curteich, Chicago Ill.
Shenvalee Hotel "The House of Hospitality" New Market VA : Postcard showing the Shenvalee Hotel in New Market Virginia. 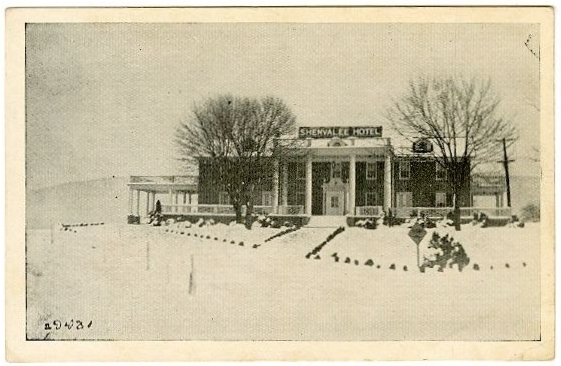 ~ Source: Herb Parker Postcard Collection ~ Creator: Genuine Curteich, Chicago Ill.
“Shenvalee,” Shenandoah Stories, accessed April 25, 2019, http://shenandoahstories.org/items/show/133.